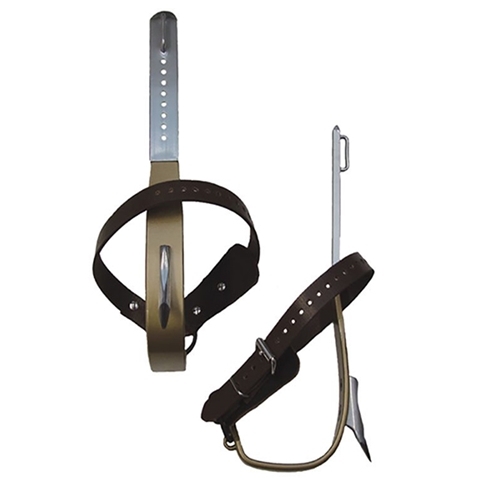 Buckingham Titanium CCA Climbers Twisted Shank | J Harlen Co.
Titanium Climber, Replaceable 1-5/8" Pole Gaff, Contoured and Twisted Shank, Offset Stirrup, 16-Degree Gaff, Nylon Foot Straps, No Top Straps or Pads. These climbers have the twisted shank option which better positions the climber shank with the supplied tunnel pads. The gold Titanium climbers come standard with the new TB9206A set –screw replaceable gaffs. These gaffs measure 1-3/4” with a 16 degree angle. The new placement design positions the tip of the gaff lower than previous models for working at more aggressive angles to the pole safely. The TB9106A gaff is available for climbing hard CCA poles.